Big congratulations to Siobhan Melba on successfully gaining her PPL. We celebrated this great achievement with her at a Friday social Pizza night. 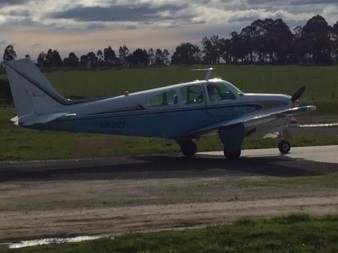 With the spring blossom causing hay fever and flying fever the Coldstream Flyers have been visiting Tyabb with some of the owners planes featuring in the Peninsula Aero Club Newsletter. There was a fun lunch at the Tyabb Packing House which is a great place to explore and grab lunch. There was also a Father’s Day Fly-In to Shepparton that the Goulburn Valley Aero Club had put on in conjunction with a tractor and steam display that was really great. Other club members made everyone jealous with a visit to a very special aeroplane in the UK. Just duck when you enter! No holiday for a pilot is complete without at least one visit to an aircraft museum or airfield. 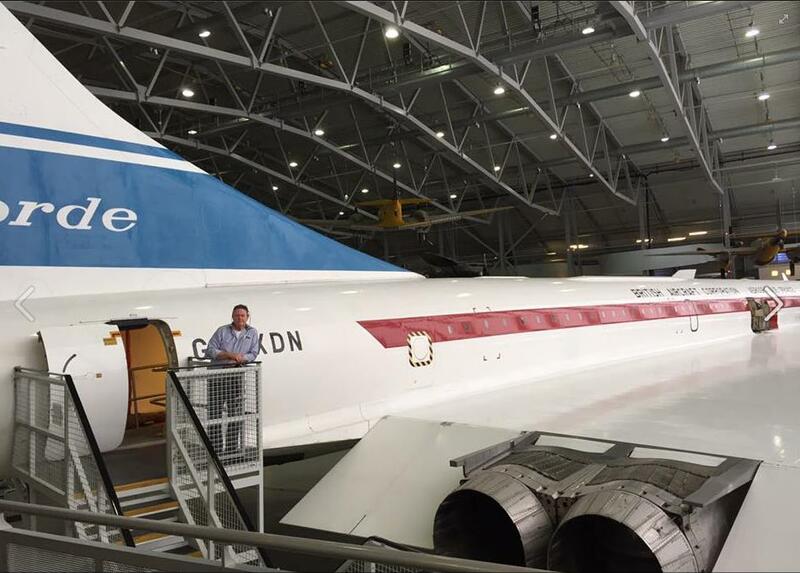 The Concorde definitely is worth a visit. The other activity that was realised in September was the “Blues Train” weekend. 14 club members went on the weekend to Point Lonsdale and Saturday Night on the “Blues Train”. The Coldstream Flyers and their partners had a fabulous weekend away at Point Lonsdale staying at a local Guest House. No planes were involved but going by the speed of some of our members on their bikes, had there been a little more wind we may have seen a few bikes flying in the sky! A few of us walked from Point Lonsdale to Queenscliff and back, some rode and a few drove. The weather was not looking the best in the morning but by lunchtime we had plenty of sunshine. The Blue’s Train was the highlight of the trip. The Bongo’s transported us to Queenscliff Station around 6:00 p.m. where we stocked up on beverages and had dinner served on the station platform. Once everyone had eaten dinner, we were on our way. There were 4 carriages, each with a different Blue’s band. We began our journey in carriage B. To enable everyone to experience each band, we swapped carriages at the 4 stops, stretched our dancing legs and replenished our supplies. At the half way mark, I personally was craving some Twisties and thankfully the station store had a few packets left. Carriage D was the dance carriage with seating running along each wall allowing enough room for our members to boogie the night away. I think Simon was a standout on the dance floor! We returned to Queenscliff station around 11:30 p.m. with the Bongo’s waiting for us to take us back to the Guest House. I personally had a fabulous weekend and on behalf of everyone that went, thank you for organizing a terrific weekend. And before you ask, we didn’t lose anyone or leave Leanne behind! EVERY SATURDAY – Peninsula Aero Club have a Sausage Sizzle, all are welcome so drop in and say hello. 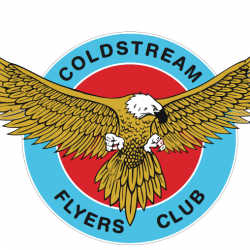 EVERY FRIDAY NIGHT – Coldstream Flyers have a social Pizza night at the club rooms from 6.00pm. WINGS & WHEELS MARYBOROUGH –24th September 2016 – YMBU Is hosting Wings N Wheels. Check out the details on the link to the event. A great day of cars, bikes, planes, aerobatics & racing and a bus that will take you into town from the airport and return. It is a great day and the airport is full of activity. TUKI TROUT FISHING – 30th September 2016 – We will be flying to Tuki for some trout fishing and lunch on the AFL Grand Final Friday Public Holiday. Those who catch trout can have them prepared for lunch and there will be other items on the menu to cater for everyone. Or you can even take some home if your catch is that successful. Check out the airfield information if you are flying in. It is under 100nm from Coldstream. RSVP through the CFC Facebook Group (link below) or email jennifer@ycem.com.au. Great family day. $35pp for fishing and lunch extra you can even take your catch home. Think you’ll never be seduced into relying on GPS instead of airmanship? Think again. How much do we rely on GPS? More and more, until we are now almost entirely dependent upon its accuracy and continued operation. But it wasn’t always that way—we used to teach proper navigation skills (dead reckoning, 1 in 60 rule etc.) Once, we used to draw tracks on paper charts and mark our times and estimates with a strange-looking thing called a pencil. I encountered an early adopter of the then-new technology while I was instructing in New Zealand in 1995. While flying a routine IFR navex with a student, I overheard the RNZAF Ohakea controller calling an unknown aircraft that had ventured into his airspace from the north without the requisite clearance. After some minutes, the pilot responded and after a few turns for identification, was asked exactly what his intentions were. It turned out that he was lost and above cloud, after having departed an airfield somewhere north of Auckland earlier that morning, using his new GPS for navigation. His wife had bought the unit for him and encouraged him to go and use it, so that is exactly what he had set out to do. The only problem was that he hadn’t taken the instruction book with him to assist with his learning. Nor had he taken any paper charts for backup. Also, he hadn’t been keeping an accurate log, so he now found himself in military airspace, above cloud, and with an increasingly frustrated controller intent on getting him out of there. He was vectored to land at Ohakea, where he was presumably dealt with in a more formal manner. I never saw the incident mentioned in any safety magazine or other media, but I can only assume that he was eventually released and allowed to resume his trip, hopefully with some paper charts to assist. Another incident occurred in the United States, when I was flying with a student on a two-hour, commercial navex. Let’s call her Lauren for this story. The night before, I had asked Lauren to prepare her chart and nav log for the trip, and to make any notes she felt she needed in order to be comfortable and prepared. I had also asked her to draw 10-mile hacks on each leg. However, this seems not to be something that the American system is too familiar with, as Lauren had never heard of them and I had to briefly explain their intended use. In spite of all this, she arrived for the flight with not a mark on her chart—not even her tracks! I decided to leave the subject alone for the moment and allow her to continue with her preparations. I had flown some instrument training exercises with her, but as this was her first VFR navex with me, I thought I’d just let her do her own thing for a while and I could debrief her later and/or fix any problems as they cropped up. Life was about to get very complicated for Lauren though, as immediately after departure I simulated a low cloud base and would not allow her above 500 feet AGL. I wasn’t intending to cause her any real problems, but Lauren’s actions at this time quickly set the scene for a great learning experience for both of us. Before we had even reached 500 feet, Lauren was manoeuvring to track via the VFR GPS fitted to the control column of the little Grumman Tiger. I reached over and turned it off, reminding her that this was to be a visual navex and she would have to find an alternative method to fix her position. She immediately dialled up the nearest VOR and attempted to navigate with that. Of course, at 500 feet, there was little accuracy in the signal anyway, but I also turned that off, attempting to make a point that she seemed determined to miss. Americans don’t like to use NDBs very much, but just in case, I also turned that off before Lauren even thought to dial it up. After a couple of minutes, it was clear to me that Lauren had neither logged her departure time, nor calculated the ETA for her first turning point, and every additional minute saw us travelling further off track as she already had a 15-degree error in her heading. Consequently, she was lost within minutes of departure—and we would still have been within sight of our departure airport if we had turned around. It was clearly time to revisit ‘Map reading 101’ and very quickly, as I didn’t want to turn around and scrub the sortie because we had to pick up another aircraft at our destination. I took control of the aircraft and asked Lauren to draw lines and 10-mile hacks on her chart, after which I proceeded to re-teach her how to navigate visually, using first the larger landmarks, and then progressively smaller features to confirm and fine tune her plotting. Given that she already had over 200 hours of experience, I had expected a much better start to our trip, but it was not going to be a waste of time if I could help it. Over the next 45 minutes or so, I continued to fly the aircraft and instruct quite heavily, with little opportunity for Lauren to do anything but listen and do as I asked. After that, I let her have the aircraft again while she applied her new-found skills and knowledge to get us to the second waypoint. By the time we got to our destination a little over an hour later, she was becoming comfortable with the technique and not even missing the GPS. More recently, I left Coober Pedy, using the GPS as primary navigation source on an IFR flight, but as I adjusted the settings the unit’s screen went blank. I now had to navigate using only the NDB, and that was quickly falling further behind me. There were no navaids in front of me on this track, but fortunately, it was a clear day and I could easily see where I was going. After a quick reboot, the unit told me we were somewhere in Europe—clearly not quite right, but at least showing it was ready to TRY and find our position. I also had an iPad with a basic navigation application, from which I was able to obtain a latitude and longitude to input into my sadly ‘dumb’ GPS unit. Finally, I had both position and track back on the GPS display, and continued to my destination without further difficulty. However, as a precaution, I remained VMC and kept a very good log of my progress in order to double check that we stayed on track. It was one of those ‘there I was’ stories for the bar or BBQ, but had the conditions been IMC, it would have been an entirely different proposition. I too had fallen into the trap of relying too much on just one system! With the stunning accuracy of GPS and the ease with which we can get around on our typically low-stress flights, it is very easy for complacency to creep in, and suddenly, to find ourselves without that essential bit of information to keep our passengers and ourselves safe—just where the hell we are.